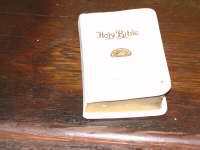 Description Holy Bible Order of Rainbow for Girls . Author and founder Rev. Mark Sexson .Presented to Debbie Arnspiger.